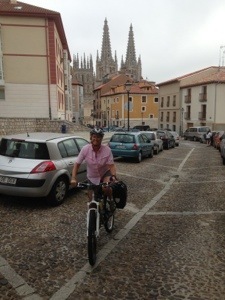 Packed up the bikes and left Burgos at 1015. 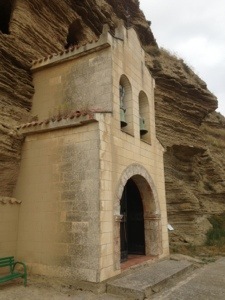 Kathryn found the place where they shot the scene in “The Way” where the gypsy father and son carry Martin Sheen’s character’s backpack to the edge of Burgos. I coined the term “Way-dar” to describe the ability to find the locations used on the movie. I may copyright it. 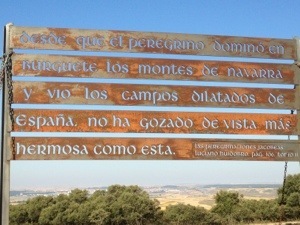 Leaving Burgos, we entered the meseta. 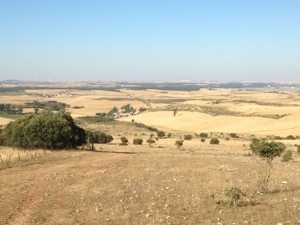 The meseta is a series of high plateaus (mesas) that offer almost no shade and very few towns. Perfect place to use a bike. Bicycling, even at our slow pace, is a lot faster than walking. 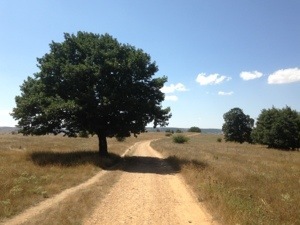 It compresses the camino experience and changes everything. 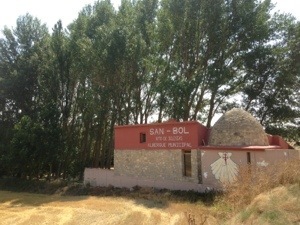 The towns, churches and landmarks approach at the speed of light compared to walking. 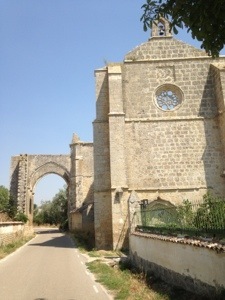 For the reason, I feel I am not continuing my Camino after walking to Burgos, I am starting a new one on a bicycle. We decided to stay in a hostal tonight. Hostals in Spain are like B&B’s without the second B. Very nice room with great view and private bath. Did you know that parcheesi is a popular game in Spain? 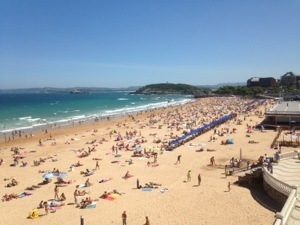 Check the photo in my post from the beach in Santander. Those four ladies crowded around something were playing parcheesi. Tonight in the bar downstairs, there was a big group playing. We had a great dinner tonight. 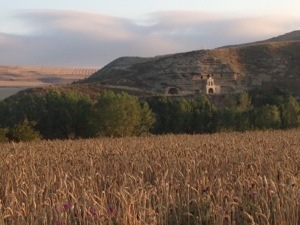 Turns out that the town where we’re staying, Castrojeriz, is the garlic capital of this area. The food was great but the hospitality was even better. 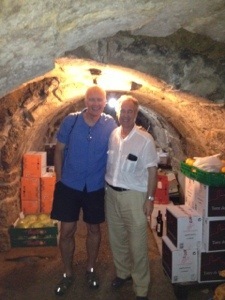 The owner of the restaurant Eduardo and his wife Dolores gave a tour of the caves underneath their house. They believe they date back to Roman times due to the size of the stones used to form the walls. It was really nice of them to take the time to show us. Today we woke to overcast skies, similar to the typical weather at home in Southern California. When I went out earlier for Kath’s morning coffee, I noticed a desayuno especial at the local restaurant so we decided to eat a big breakfast while we were waiting for the weather to figure itself out. 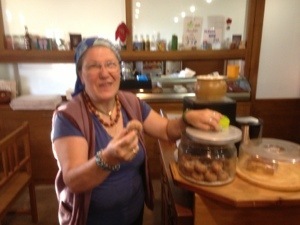 The food was really good – fried eggs, sausage, bacon, juice and coffee. 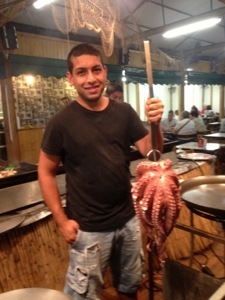 A lot more food than the locals normally eat. By the time we ate and packed our bags to leave, the clouds started to burn off so we headed back to the beach until our bus left for Burgos. The tide was really low and the crowds were much less than yesterday so the beach had a whole different vibe. We were able to walk out to some tide pools and around the rocks to the adjoining beaches – Playa de La Concha and Playa del Camello. It reminded me of Laguna Beach. 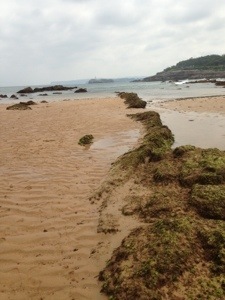 We continued our walk to the larger peninsula that protects the mouth of the Santander harbor. It features a well-developed City park with lots of facilities to enjoy the now beautiful weather. I’m constantly struck by the number of people walking the streets, sitting on the park benches and taking full advantage of public gathering places. As an architect and land planner, I often try to recreate these type of places in new communities but the result often seems contrived and under-utilized. I’m convinced this is a cultural problem primarily caused by our dependence on the automobile rather than public transport. 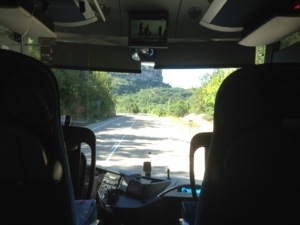 Spain is supposed to be in severe economic crisis but their public transport system is excellent. City buses take you anywhere for less than $2. 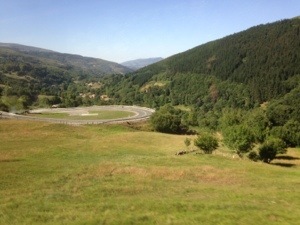 Our 2-1/2 hour ride from Burgos to Santander cost about $16 on a deluxe touring bus. Right now I’m writing on a upscale Supra bus with leather seats, wifi and bottled water. This ride cost us a whopping $25 each. 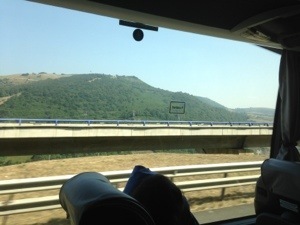 I’m a little apprehensive as the bus nears Burgos. 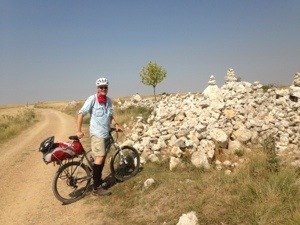 After four days of rest, our Camino continues tomorrow with a bicycle ride westward. Our bikes should be waiting for us at the hotel so we should have time to take a test ride tonight. After several days in the 90’s, the weather is supposed to be cooling to the 70’s, which should be perfect for riding. 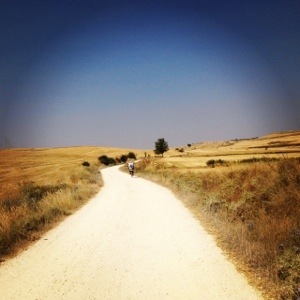 What does the Camino have in store for us? Last night’s hotel was perfect to celebrate our anniversary and we took full advantage of it by checking out as late as possible. Today’s challenge was to find accommodations more typical to our price range. After checking the list of hotels provided by the tourist office, we found a pension near a beach that we heard was pretty nice. The room was about 1/3 the cost of surrounding hotels so we set our expectations accordingly. 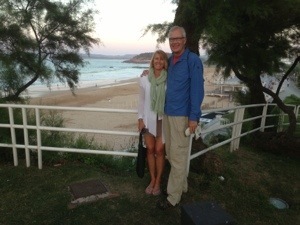 After about a 15 minute ride on a city bus, we arrived at Playa de El Sardinero. The beach was packed with people but it was really a stunning setting. 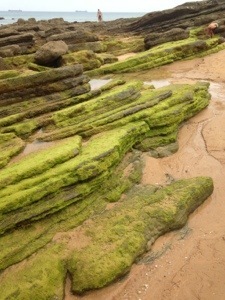 The beach was about 1.5 km long set between rock peninsulas that jutted into the Atlantic Ocean. After dropping off our bags and picking our room, we headed back to the beach. The rest of the afternoon was spent walking the beach, having lunch and laying on the sand. 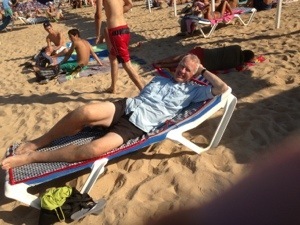 I may have snuck in a little siesta as well. We stayed on the beach until 7 pm and then went back to our room to get changed and enjoy the cocktail hour on the pension’s front patio. 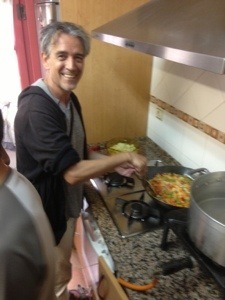 it was around 9 pm when we left the pension and grabbed some nondescript food down the street. After that we headed over to the sports stadium to check out a festival that we had heard about. It turned out to be food and music festival with offerings from around the world. We were really bummed we had already eaten dinner but we enjoyed the dance music and some libations at the Mexico booth. 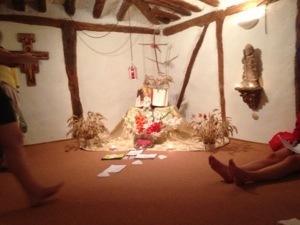 It was after midnight when we snuck into the pension quietly as possible. Since we now have the opportunity to relax for a few days, we need to decide how best to use the time and then how to continue the Camino. I tried to answer the second question first. I haven’t mentioned it before but one thing that you notice when walking the Camino is how many people are following the trail by bicycle. For the most part, the trail is ideal for a mountain bike. When I was crawling along with my swollen legs, I thought more than once how it would be fun to do a section of the Camino with a bike. Now I have a chance to do so. 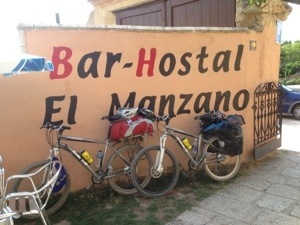 I investigated a few companies that provide bikes in Spain and eventually arranged for two mountain bikes to be delivered to our hotel in Burgos on Thursday. 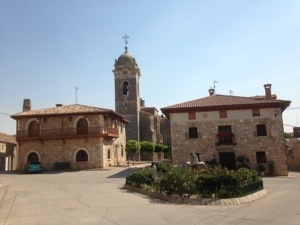 If we ride 25 miles a day, we can make it Mansilla de las Mulas (just short of Leon) in four days. We’ll leave the bikes there and take a train to Madrid the next day. 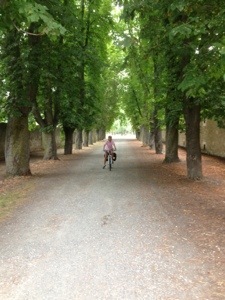 I tested my legs while riding a bike in Burgos and it seems to be more comfortable than walking. Even with a leisurely pace, we shouldn’t have to ride more than 3 hours a day. The weather is cooperating as well. Yesterday, today and tomorrow has been very hot (around 90) but it’s cooling off starting on Friday when we start our ride. The other question above is what to do while I rest for a few days. 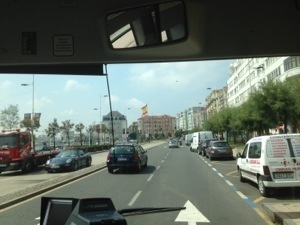 Since it was going to be very hot in Burgos, we decided to take a bus to Santander, a resort town on the Atlantic coast. I had no idea what to expect but it has turned out pretty great so far. The bus ride was incredible. Rather than follow the freeway, the route crosses a spectacular canyon with narrow roads, switchbacks and gorgeous scenery. It reminded me of the high country in Utah, except there’s 400-year old villages scattered around the countryside. 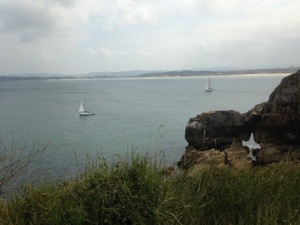 Eventually, we reached the coastal plain of Cantabria which features beautiful beaches and dramatic cliffs that drop into the Atlantic Ocean. 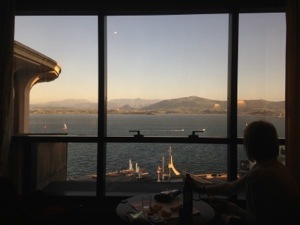 Since it was our anniversary, we splurged on a fancy hotel downtown with a spectacular view of the harbor. Honoring my policy to ignore the actual cost of non-Camino expenses, I’ll just say that it cost 16 nights in a private albergue. 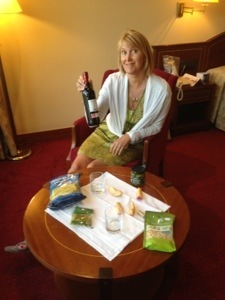 After we checked in we enjoyed a bottle of local red wine and a few snacks that we had collected from the grocery store. The sunset on the mountains across the harbor was magnificent. Once it got dark, we went out prowling the bars and restaurants in the neighborhood surrounding the hotel. 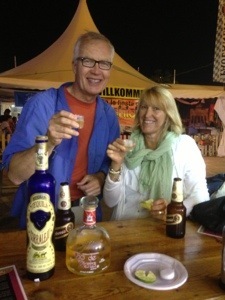 Given the warm nighttime temp’s, the bars were packed with locals and tourists. We finally found a table at a popular place and enjoyed our official anniversary dinner. 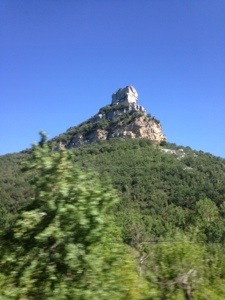 Tomorrow we’ll move to a different (cheaper) hotel and enjoy another rest day before heading back to Burgos on Thursday. Before I forget, I want to thank all of my friends and family who are following this blog and making comments. Thanks also to the people I haven’t met in person but made contact through the Backpack Club (my name for fellow peregrinos). 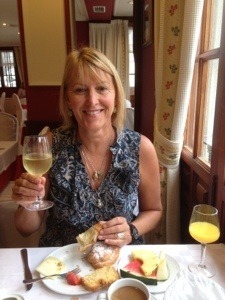 My wife Kathryn arrived safely last night around 5 pm after making her connection to the train in Madrid. It was a good thing that she made it because the next train was sold out. 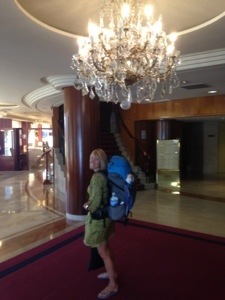 I was already cleaned up by the time she got to the hotel so she didn’t have to see the grimy peregrino (yet). 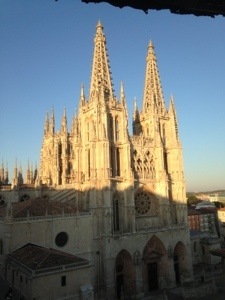 Our hotel is the Meson El Cid and it features a drop-dead stunning view of the cathedral from our room’s window. I’d love to tell you how I managed to get such a choice room but it was just luck. We are directly across the entry plaza so our entire view is filled by the church’s facade. After we got settled we went out for a stroll around the area. It stays light until after 9 pm so dinner starts late. 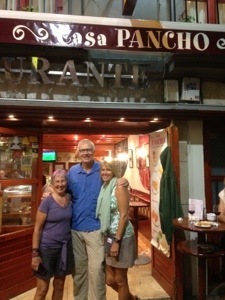 We met my friend Nancy for dinner to celebrate our safe arrivals into Burgos. 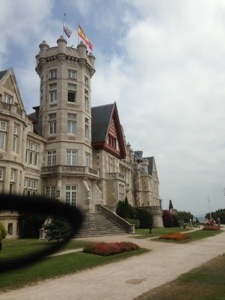 It was a pretty fancy place and I won’t say exactly how much it cost but it added up to five menus de peregrino. Today was a day of rest. We slept in until 9 am or so and barely managed to make the breakfast that ended at 1030. After that, I decided to see if I could find a doctor to look at my legs. Since I bought a travel insurance policy and it wasn’t an emergency, it took me the rest of the morning to call the insurance company, coordinate with their European service provider and find a doctor nearby. Around 1 pm I walked a few short blocks to a local hospital and was greeted personally by the medico at the reception area. After a discussion of my symptoms, he decided to take some x-rays. Although the x-rays showed an interesting growth on my left heel (which has been there a long time), there was no indication of anything that would cause the pain I’ve been having. When the doctor returned to the examination room, he gave me his opinion that I should rest for a week and not walk any more of the Camino. Some of you may see this as a horrible news, but I see it a bit differently. First, I’m not necessarily going to follow the doctor’s advice. My legs are definitely beat up because that’s what the Camino does. Second, taking a few days off is a great chance to celebrate our 30th anniversary in a little more style than a 5 euro a night municipal albergue. 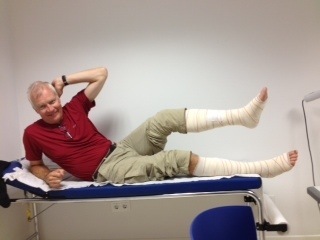 So here’s the new camino plan: relax until the end of the week and see how my legs feel. If I’m doing better, we’ll continue for the days remaining. If not, we’ll have a relaxing vacation in a gorgeous country. 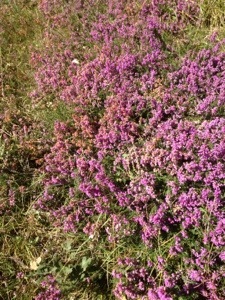 I’ve only walked for ten days but the Camino has taken a toll. My pace has slowed from about 3.6 km/hr to 2.8 km/hr. The walking is slower, especially on the downhills, and the rest breaks are longer and more frequent. 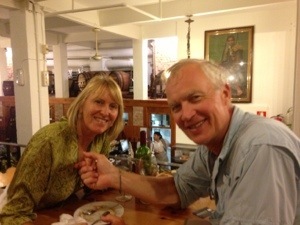 I’ll have some deep thoughts tomorrow but today is all about getting into Burgos to meet my wife Kathryn. 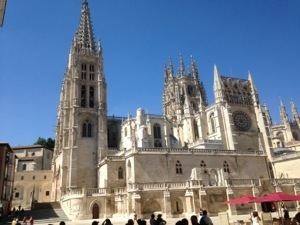 Her flight to Madrid lands at 10 am and she’ll take a train to Burgos that arrives at 4:30 pm. 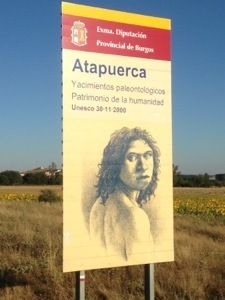 The first part of the walk today leaves Ages and quickly reaches Atapuerca where human remains over 900,000 years old were found. It reminds me of the Mel Brooks routine about the world’s oldest man. Google it. The route continues over a large hill and finally the city of Burgos comes into view. 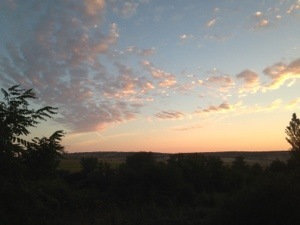 There’s another prayer circle at the summit of the hill before descending into rolling wheat fields where hunters are using their dogs to flush birds from the rows of cut grain. I’m used to hunting in the USA where you have to stay away from roadways and buildings. 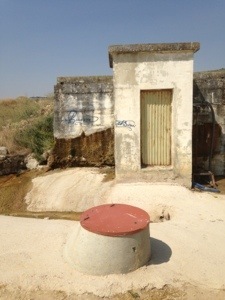 It’s a lot looser in Spain and the hunters are hunting within 100 yards as you walk by. 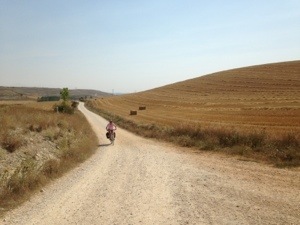 The Camino eventually crosses the freeway and follows the length of the Burgos aeropuerto to a road intersection. 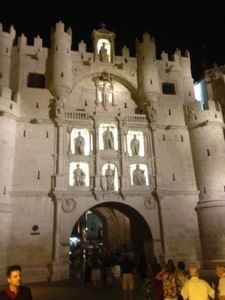 This is a critical option to your experience entering Burgos. If you turn right, you’ll walk along the sidewalk along a busy roadway for the next few hours. 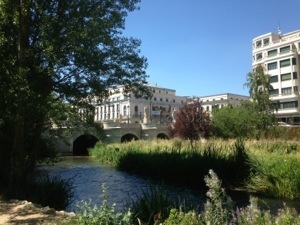 If you cross the road and walk about ten minutes, you’ll follow the river all the way to the cathedral. 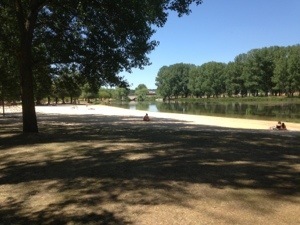 Luckily, my friend Nancy had alerted me of this option and I found the river easily. If I hadn’t, I would still be out on the road mumbling to myself and scaring passersby. The path started out pretty simply but got nicer and nicer as you got close to downtown. Since it was Sunday, a lot of people were enjoying the walks alone, with family or with friends. Those of you who have spent time in Europe know how the people love to walk. By the time I got to the bridge that would take me to the cathedral the walkway was packed with people. 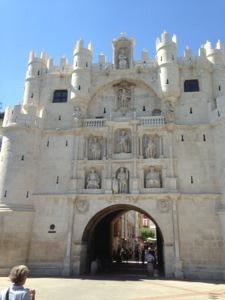 I passed through one of the arched entrances into the plaza in front of the cathedral. 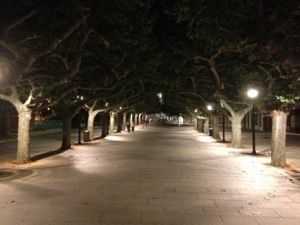 Our hotel was situated on the plaza as well so I checked in and waited for Kathryn to arrive. 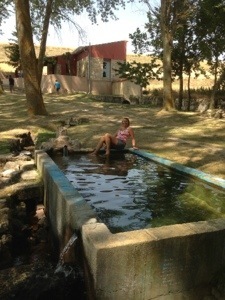 After two nights in a donativo albergue, I’m ready for a real bed. 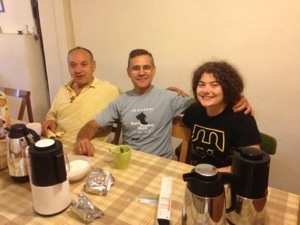 A donativo is an albergue run by dedicated volunteers who serve two weeks at a time. 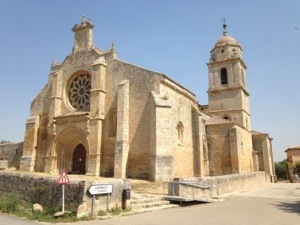 The albergues are typically associated with a local church, and the experience includes a communal meal, evening prayer service, sleeping mats on the floor, and a simple breakfast in the morning. Sort of like a slumber party for grownups. The word donativo means that you make a voluntary contribution when you leave in the morning. 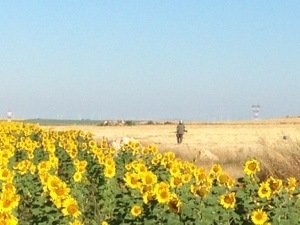 When I left at 0745 this morning, most of the other pilgrims had already hit the trail. This is fine with me because the mornings are cool and it’s a great time to walk by yourself. 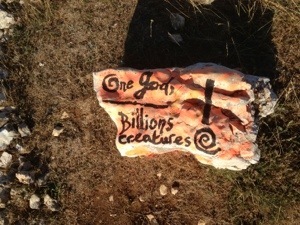 Since there was no wifi last night, I posted my last blogs along the trail today. I took a lot of breaks (note my average speed below) but both my legs were hurting and I didn’t want to push the pace too hard. The second half of the day was spent without villages so it was a pretty quiet experience. I was considering stopping earlier than I planned but I took a long break, changed my socks and felt like a new man. 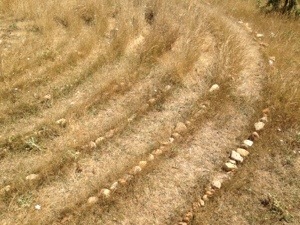 I’m really glad that I continued because the last hour was through a shaded forest and I got to walk a labyrinth. Now I can walk into Burgos tomorrow to meet Kathryn. She lands at 10 am in Madrid and will take a train to meet me. Monday will be a rest day.